Looking for a new cloth diaper detergent? We recommend Nellies Laundry Soda most frequently. It's all natural, and doesn't leave a residue. Read on to find out what we like most about it, and why we so regularly recommend it. When I first started using cloth diapers, we tried to get away with a grocery-store brand of detergent. We had good luck with Sunlight, but when they launched their 3x concentrate, it became a challenge to get just the right dose. My sister, who started cloth diapering a bit more than a year before I did, had experimented with several brands, and I tried Allans, but neither of us were happy with the results. Then one day my sister called me to tell me about a new brand she had discovered: Nellies! We were both familiar with Nellies because a few years before my mom had given us each a package of their dryer balls for Christmas. I had used for several years before they wore out and I switched to wool dryer balls. She had been using Nellies for a couple of weeks and was thrilled with it. That was all the coaxing I needed. I headed to our local cloth diaper store, and picked up a package for myself. With a laundry softener and a high-efficiency washing machine (I've been told ours is one of the most water-efficient on the market - which has been a struggle for using cloth diapers! ), we had experienced both detergent residues and urine residues. Could a tablespoon of Nellies work? Work it did! It worked wonders! Some of our night-time diapers had grown dingy, but with every load I ran using Nellies, I saw them lightening up. 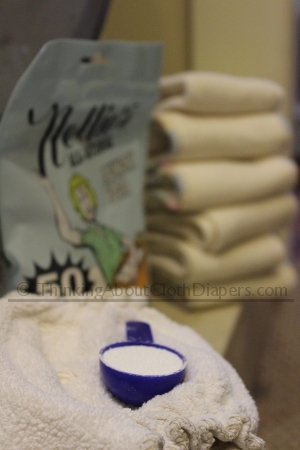 Unlike a lot of cloth diaper detergents, Nellies doesn't come in a lot of scents... it's a fairly mild smelling detergent, but it leaves our diapers residue free and they smell fresh - kind of like clothes coming off of the line. What I love about Nellies Laundry Soda is that it is made of all natural ingredients. Besides being all natural, it's also non-toxic, a major consideration for us because of pets and kids. We have our washing machine and laundry supplies on the second floor right in our main living space, and I felt much better knowing that the detergent we were using didn't pose any concerns. Another great feature of Nellies is that it dissolves equally well in hot and cold water. We wash our cloth diapers with hot water, but for most of our other loads we've switched to cold water washing. Lots of the environmentally-friendly detergents aren't effective in cold water, so we love that Nellies is! While we usually use Nellies on cloth diapers, I sometimes use it on other loads as well. My husband has very sensitive skin and suffers from eczema at times, and Nellies hasn't bothered him at all. Nellies is actually hypoallergenic, and is made from sodium silicate and coconut oil-based surfactants. Once our other laundry detergents are gone, I'm going to switch over completely. My sister already made the switch to using Nellies full time. She bought a 1000 load pail through Costco, and now uses Nellies for everything - even the barn clothes! Nellies recommends 1 tablespoon of detergent per load. While we now have soft water, both of my sisters have hard water and have had no trouble with their cloth diapers following the instructions. One of my sisters has a top loader, the other has a front loader. So the tablespoon seems to be fairly fool-proof. My sister said she adds a scoop of Oxyclean in addition to the Nellies when she washes barn clothes, but otherwise uses only a scoop of Nellies per load for everything - towels, dress clothes, kids clothes, jeans, cloth diapers, and everything! She's been using Nellies for over a year now with no issues at all. To find out more about Nellies and their full line of laundry products, you can visit their website or check them out on Facebook. Where Can I Buy Nellies? You've got to try Nellies Laundry Soda! If you would like to buy, check out Nellie's On-Line Store. If you live in the US, you can also buy it through Amazon.com and Canadians can find it on Lagoon Baby. When I heard that Nellies was looking for bloggers to help them promote their laundry detergent, I knew it was a match made in heaven. 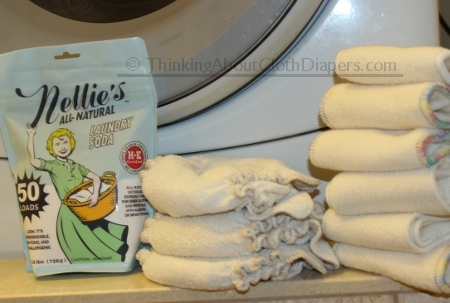 While I did receive a package of Nellies Laundry Soda free of charge, I already use it faithfully on my cloth diapers, and recommend it frequently. Some of the links above are affiliate links. For more cloth diaper laundry information, return to Washing Cloth Diapers.